Peas are cool-season vegetables hardy enough to be grown almost anywhere in the United States, according to the University of Illinois Extension. Peas are classified as English (garden) peas, which are eaten for their seeds, snap peas, which are sometimes called green beans, and snow peas, which have tender, edible pods. For germination of pea seeds to occur, the seeds must be planted when the soil is workable, dry (will not stick to the garden tools) and has a minimum temperature of 45 degrees Fahrenheit, according to the University of Illinois Extension. These plants grow best in temperate climates with cool spring and fall weather. Peas, like most vegetables, germinate and grow best when planted in full sunlight. The soil should be rich, loamy and slightly moist, but not soggy. Well-draining soil is essential for proper germination and growth, according to Ohio State University Extension. Pea seeds must be planted at the correct depth to germinate. They are shallow-rooted plants and should only be pressed into the soil about 1 inch deep at the most. Plant pea seeds in rows, with individual seeds about 2 inches apart, according to Ohio State University Extension. Space the rows about 2 feet apart. Newly-germinated pea seeds will not compete well with weeds, according to Ohio State University. Weeding must be done as soon as seedlings appear. Careful cultivation is necessary to avoid damaging the pea plant's shallow roots. Adding a thick layer of mulch (2 to 3 inches) will retain moisture in the soil and stifle weed growth. Many popular varieties of peas are now self-supporting and do not need supports such as trellises or poles. 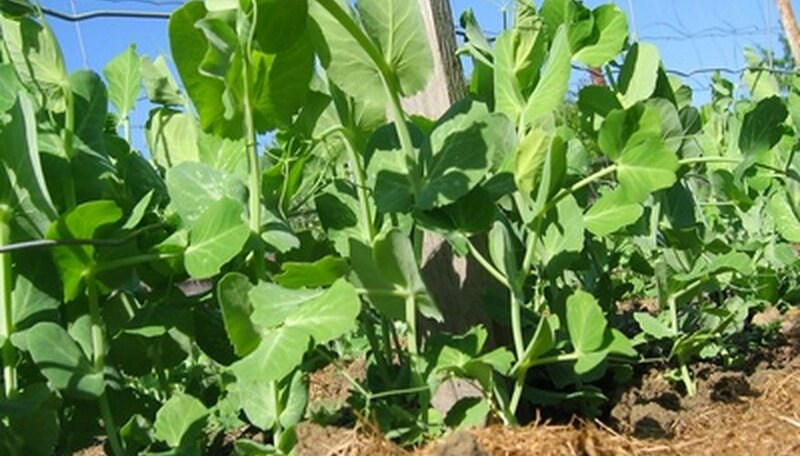 Pea plants can be bothered by soil-based fungal diseases such as root-rot, but these can be avoided by planting the seeds in raised beds, amending the soil with organic materials and ensuring the pea plants are not over-watered. Common insect pests, such as aphids, can also infest pea plants. Control severe infestations with insecticides.